You are only 20 minutes away from enjoying a nutrient dense dessert that is so tasty, you can’t eat just one! I love dessert more than I love any other meal or snack. I am a sweets lover and I know that it is important to be thoughtful about how much sugar I eat every day. Luckily, with some experimenting, I have found some pretty tasty ways to enjoy my favorite treats in a healthy and fun way. These Almond Joy Energy Bites have only 1/4 cup of added sugar from the maple syrup and a little bit of the chocolate drizzle. 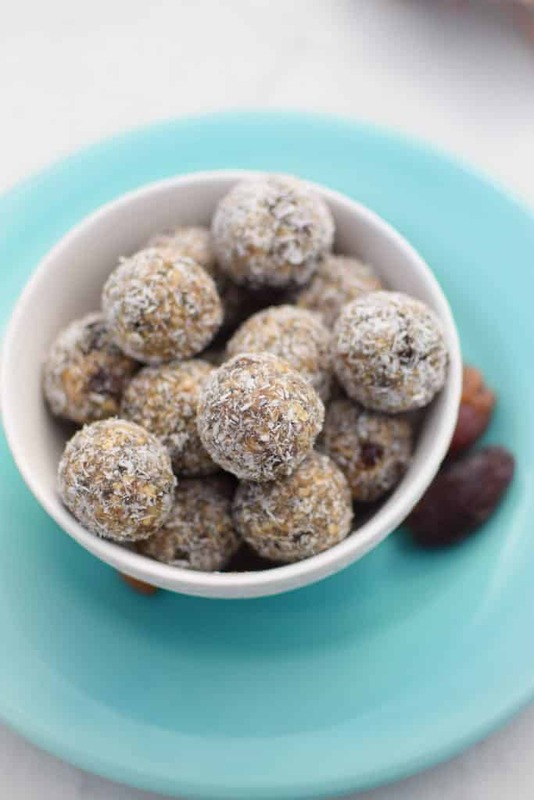 Otherwise, these tasty treats are naturally sweetened with dates. One of the most important aspects of enjoying a healthy dessert is ensuring that the treat is also packed with nutrition. 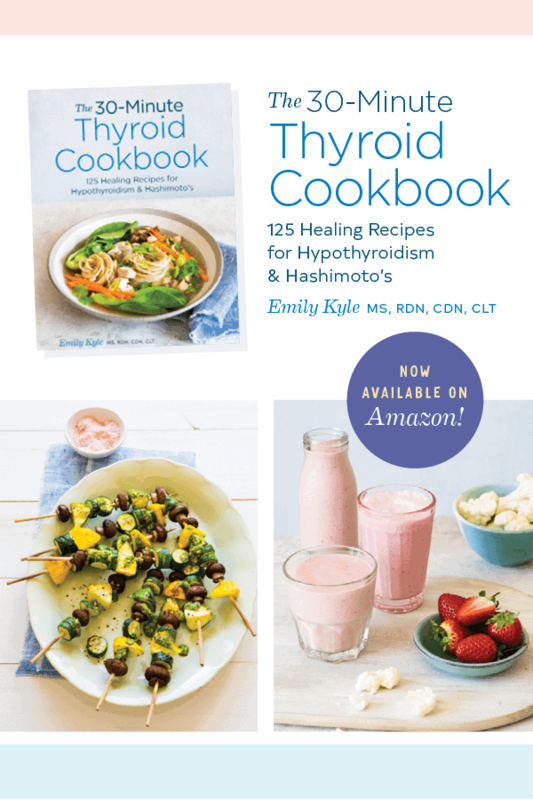 These tasty bites are nutrient dense and provide many important vitamins, minerals and amino acids that will serve the body well. The oatmeal and chia seeds provide complex carbohydrates that help to prevent blood sugar spikes, while the almonds and almond butter provide heart-healthy fats needed to keep you full and focused during the day. Serving Size: These tasty treats make the perfect dessert – or even breakfast or a snack! They are pretty filling and 2-3 bites make a perfect serving size. In a large bowl stir the oats, almonds, chia & flax seeds together and mix well. Add the dates, coconut milk, almond butter, maple syrup, coconut oil, almond and coconut extract. Using your clean hands, mix everything together well. The warmth from your hands will help to melt the almond butter, creating the perfect consistency. Create 1 inch balls and roll between your palms until they are perfectly ball-shaped. If you are doing a chocolate drizzle, set aside on parchment paper. 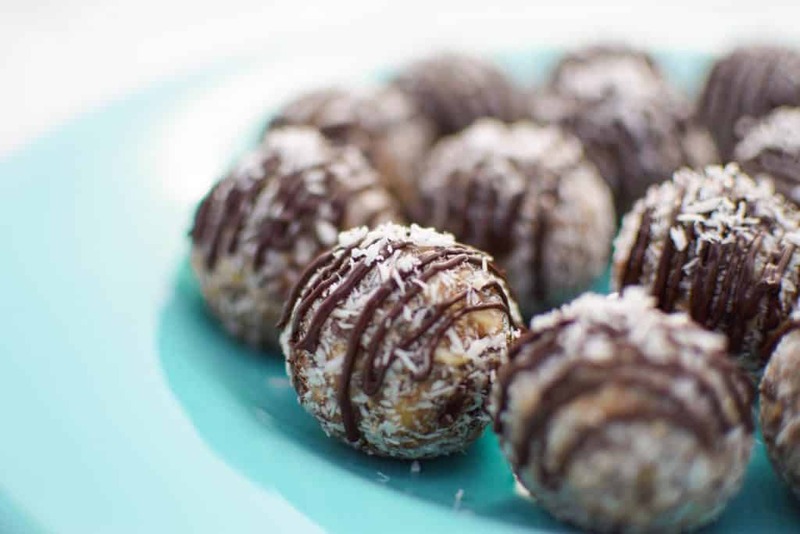 When all the bites are formed, roll each ball in the coconut flakes and return to the parchment paper. In a small microwave-safe dish microwave the chocolate chips for 60 seconds. Remove, stir and add coconut oil, microwave for another 30 seconds. Remove and stir. Microwave in additional 30-second intervals as needed until smooth. Gently pour chocolate into the corner of a ziplock bag. Snip a small piece off the corner and drizzle away.